Our Lady of the Angels Region operates three community centers and several homeless transitional shelter programs. For community services centers, click here. Our Lady of the Angels Region of Catholic Charities covers downtown and central Los Angeles west to Malibu and south to Los Angeles Airport (LAX). Focused on addressing the issues of Inner City Los Angeles, Our Lady of the Angels Region operates three community centers and several homeless transitional shelter programs. To meet the special needs of extremely impoverished individuals and families, the region offers case management, basic needs assistance, health counseling and referrals. Adeste childcare and after-school mentoring programs are also available to give children and pre-teens a step up and keep them away from gang culture in the city. 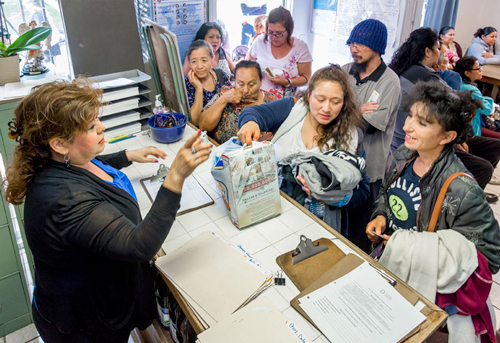 Three of Catholic Charities’ shelter programs, located in the Echo Park neighborhood of Los Angeles, are solely for women and mothers with children. Languille, an emergency shelter, Hawkes Residence, Farley House and Angel Guardian Home, a bridge and crisis housing, are all part of Catholic Charities’ Good Shepherd Center program.